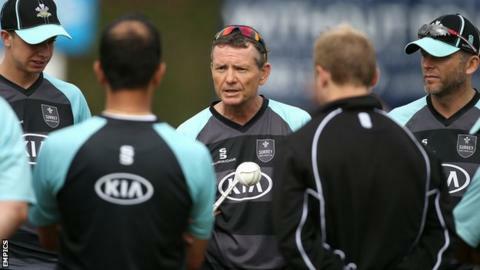 Surrey coach Graham Ford says he has been encouraged by some of the team's performances this season despite the club failing to win promotion. They were aiming for an immediate return to Division One of the Championship, but had to settle for a mid-table finish. "We made some really good progress in the middle of the summer. "I think I have seen enough good things happen to be quietly confident about next summer," he told BBC London 94.9. Batsmen Jason Roy, Rory Burns, Zafar Ansari and pace bowler Matt Dunn, all aged 24 or under, are among the players to come to the fore this summer. "You are always greedy and would like to have a little bit more progress, but if you look at the performances of a number of the younger players, they have really improved and taken their games forward," said Ford. "I have been very impressed with the attitude and fight the group have been prepared to put in. "We have had some tough times but they have always fought very hard and we have come back from some tough situations. "There have been some very encouraging individual performances and next season we need to be more consistent." "I can't wait for next summer to start and I hope the players are in the same place. If we can have a focused good pre-season then we can set ourselves up for some happy days next year." Ford joined Surrey at the start of the season on a three-year deal and said he had really enjoyed his first summer with the club. "It has been a fantastic experience," the South African said. "That leaves me in a situation where I can't wait for next summer to start and I hope the players are in the same place. "If we can have a focused good pre-season then we can set ourselves up for some happy days next year."